The Liquefaction Project (Trains 1-3) and the proposed Expansion Project represent a significant investment in U.S. energy infrastructure that will create jobs, support the economy, help small businesses grow and help America’s trading partners in Europe and Asia. 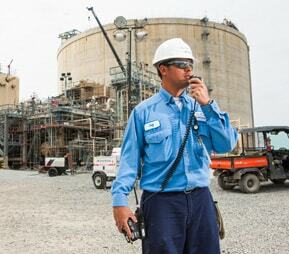 Cameron LNG will add nearly 6,500 jobs during the peak of construction of Trains 1-3, approximately 160 full-time jobs here at the liquefaction facility and 60 full-time positions at Cameron LNG’s headquarters in Houston, Tx. The Expansion Project represents an increase in operational employees of more than 50 additional full-time jobs. The Liquefaction Project (Trains 1-3) will invest approximately $10 billion in new facilities, equipment and labor, thereby, supporting economic growth. Additional investments will be made with the Expansion Project, consisting of two more Trains. Nationally, LNG exports have the potential to generate hundreds of millions of dollars in economic development and new tax revenue. The 2012 NERA study released by the DOE confirms that providing U.S. natural gas resources to global markets will net benefit the U.S. economy under all scenarios considered. Further, those benefits increase as the level of exports increase. Cameron LNG estimates the Liquefaction Project customers for Trains 1-3 will export an average of approximately $8.6 billion of LNG per year, and oil and natural gas liquids production is expected to average $2.2 billion averaging total trade balance benefits of $10.8 billion per year based on 2011 dollars. Bringing natural gas to global markets will improve the terms of trade and strengthen ties with our world partners.